DiskInternals Linux Reader provides several disk management tools in an easy-to-use interface. Most notably it includes a tool for reading disks formatted to to a variety of file systems for Mac and Linux, as well as virtual disks from VMware, VirtualBox, VirtualPC and Parallels (VMDK, VHD, VDI, HDS). The program can also create disk images. 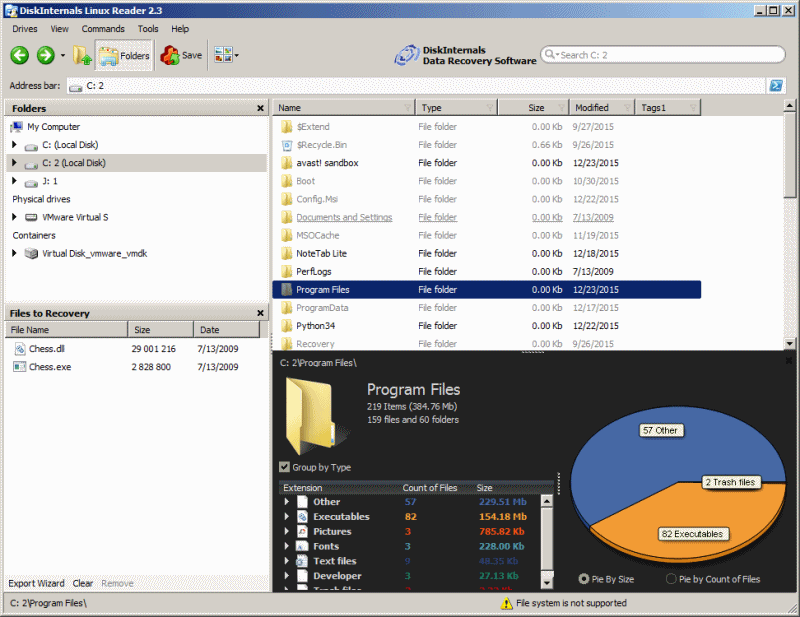 The interface includes a disk usage window, basic file search, and a preview option for pictures and text. Can create disk images (.img and .dsk), including boot sector. Filesystems supported include: Ext2/3/4; ReiserFS, Reiser4; HFS, HFS+ (Mac OS); FAT, exFAT; NTFS, ReFS (next-gen Windows filesystem); UFS2. Tested with Mac-formatted HFS+ drive today and this worked beautifully. Very easy and fast. @Midas: I agree. I was the one who added the 64-bit download link before Checker removed it. @checker: after my experience with the largely illiterate (*ducks*) masses of the Net, I believe a link is more eloquent and straightforward than a note. For one, it's part of the the database structure, while a note is easy to overlook. I motion for the link to be reinstated. This program saved me when I had a Win7 VMware installation go corrupt on me. Fantastic. There does not seem to be a need to provide separate 32-bit and 64-bit download links; they appear to point to the same file (which contains both versions, when extracted/installed). Program seems to run fine but gives a "need admin rights" type error message when attempting to search for linux partitions. I try this tool, but it not works for me, until I recognize that I am fool. Reason is that I have Suse Linux which is on ReiserFS partition. So if someone need aplication to copy files from Suse, he can use this http://yareg.akucom.de/ it seems to not write to registry - probably well portable. Remember you have to open the .exe with a packer like 7zip. The Program works fine, it instantly recognized my ext drives and lets me read-access them, 2MB small and tidy -- i like it. Running it the first time created a tiny registry entry (only a run entry) on my pc, (can be found searching for "diskinternals" e.g. ), so i removed that one and tried again - it still worked perfectly and no new entry was created, so it must have been my fault.